Alison Eddington : ABC Young Performer of the Year 1995. 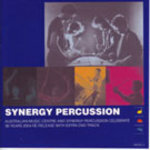 Soundscapes (1983) for percussion and orchestra. Recorded/performed at: Queensland Performing Arts Complex, Brisbane, on 24 Aug 95. Richard Mills Queensland Symphony Orchestra, Alison Eddington 23 mins, 51 sec. Recorded/performed at: Eugene Goossens Hall, ABC Ultimo Centre, on 9 May 96. Martin Wesley-Smith Alison Eddington 6 mins, 19 sec. Recorded/performed at: Eugene Goossens Hall, ABC Ultimo Centre, on 9 May 96. Nigel Westlake Alison Eddington 5 mins, 40 sec. Also includes: Dream of the cherry blossom / Keiko Abe -- Rhythm song / Paul Smadbeck. Promotional CD - not for sale. Score: Soundscapes : for percussion and orchestra / Richard Mills.